Get it? A Primer? Because you use primer on makeup? Oh forget it. If you have a tween in the house, something you might be dealing with is the idea of them wearing makeup for the first time. This might bring back memories of fights with your own parents about wearing makeup when you were young, but let's face it. We all had that fight. And our parents eventually relented, aaaand we went to school wearing bright blue eyeshadow and foundation two shades wrong for our skin tone. It happened, and we survived it. And yes, you will survive this as well. Here are some tips as to avoiding both the fight and the clown car makeup disasters that we did. Rule 1: Don't fight too hard. Fighting too hard with a tween is going to end poorly. They're going to go to Walgreens behind your back and get the makeup anyway, and it will be too much and applied poorly, and no one wants that. Instead, unless you are 100% against the idea in the first place and there is no budging on your part, work with your tween during this time. There are ways to appease the rolling eyes and stamping feet and still keep your kid a kid. No, really, there are. Rule 2: Boundaries. If a little makeup is fine for a school dance or you'll relent on lip gloss and mascara for school, go with your tween to buy it. Make sure they use their own money, though. Let's be reasonable, if they're "old enough" for makeup, they're old enough to buy it themselves. Growing up isn't too fun then, eh, kids? Yeah, I didn't think so. Plus, then it's theirs, and not YOURS. I destroyed countless items in my mom's bathroom drawer doing makeup experiments, and I don't think she's ever forgiven me for it. I'm 39 years old. Rule 3: Minimalism. 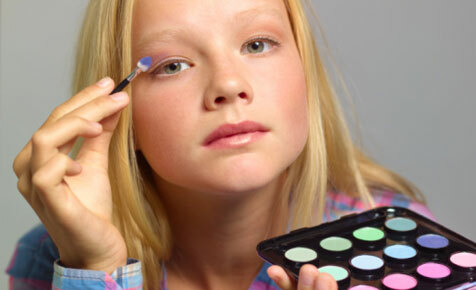 Your tween doesn't NEED makeup. You know this and I know this, so please explain the "less is more" concept and stick to it. A dab of concealer on a wretched zit, a brush of powder, lip gloss and the tiniest bit of mascara is more than enough for a tween, and it really opens up the opportunity to talk with that tween about self-esteem and not making themselves up for anyone else. Makeup, above all, is for making themselves feel good, not anyone else. The natural look is great, and you can explain that it emphasizes their own beauty instead of making them look like someone else. They are their own person, not Kylie Jenner, and that's great. Help them realize that there is absolutely nothing wrong with looking like their own person. Rule 4: Avoid comparisons. "But YOU wear red lipstick!!!" Yes, I do. I'm also a grown adult, and you are not, so zip it. Or you could go the kinder route and say that when they have their own job and can afford a full face of makeup, they can do it then. Trust me, even drugstore makeup is scandalously expensive to a tween, and when you point out that a full face of makeup will set them back tons of cash, their tunes, they will change. Rule 5: Give a little. Tweens are going to look at celebrities and want to look like them. It's a hell of a thing, and we work as hard as we possibly can to help them realize that's not the truth, but it happens. We wanted to look like Madonna back in the day, and now they're going to want to look like Taylor Swift or whoever is popular now, don't ask me, I'm old and decidedly not cool. So when the argument happens, show them that the minimalist looks described above are perfectly reasonable and most importantly, age appropriate. Kids grow up far too fast, and if you make concealer and lip gloss seem like the best thing in the world, they will be less likely to beg for more. Remember, you're the adult, and what you say goes, but you were once a tween too. Try to keep that in mind when the "But eeeeeeeveryone eeeeeeeelse iiiiiiiiiiiis!!!" whining begins. You've got this. Trust me.